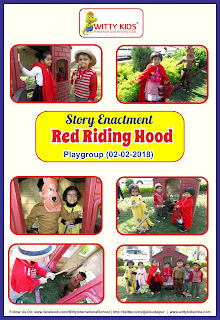 On Friday, 02nd February, 2018 Little Wittians of Playgroup at Witty International School, Udaipur, enthusiastically participated in a story enactment of “ Red Riding Hood”. They came dressed up in a creative way according to their character like Red Riding Hood, Wolf, Mother, Woodcutter etc. The Garden area was decorated according to the theme of the story. Children enjoyed enacting the characters they were dressed as. It was a Fun Frolic day for them.